At the SPS IPC Drives fair, the EPSG will be demonstrating how multiple machines can be synchronized in hard real time with OPC UA TSN. Visitors to Booth 306 in Hall 5 will see first-hand how drives in five separate POWERLINK networks run in absolute synchronization. Their network clocks are synchronized via a shared OPC UA TSN network. 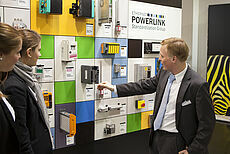 The live demo at the EPSG booth comprises five independent POWERLINK networks with controllers and drives from various vendors. Not only is each POWERLINK network tightly synchronized internally, but interaction between them is also perfectly orchestrated. This is made possible by controllers that are enabled for both POWERLINK and OPC UA TSN communication. The TSN network is set up using switches from Cisco, TTTech, Kontron, Moxa and Hirshmann Belden. Also connected to the TSN network are an HD camera providing a live stream, as well as OPC UA TSN bus controllers from B&R to visualize the highly-precise synchronization using connected LEDs. The demo shows how easy OPC UA TSN makes it to join multiple existing machine networks into a single real-time network. OPC UA TSN makes it easy to set up controller to controller communication at the line level. Together, open standards POWERLINK and OPC UA TSN satisfy all the requirements of Industrial IoT solutions. The EPSG booth at the SPS IPC Drives fair will present the first-ever demonstration of real-time synchronization between five POWERLINK networks using a shared OPC UA TSN network.